For Recurring Payments, Coupon Codes and Discounts applied to an entire order will only discount the initial recurring payment; all future payments will be at full price. If you would like to offer a Recurring Payment discount that applies both to the initial payment and all subsequent payments, you will need to create a Coupon Code that applies specifically to those payments (in addition to any other Coupon Codes you already have). Select Apply this coupon for: Individual Items within an order. Note: only items that have already been set up and published in the campaign will show in this view, so be sure to set up all of your donation levels before setting up individual coupon codes. This will open a popup window where you can select the Recurring Payments that will be eligible for the discount. Scroll past the One-Time Donations section and select the Monthly/Quarterly/Annual Payments that your coupon will apply to by clicking Select or Deselect All, or using the checkboxes next to each payment type. Hit Save when done. Enter your Coupon Code Title. Note: this will need to be entered verbatim by your supporters to redeem the discount. Set your discount as a percentage of the total price (%) or a fixed dollar amount ($). 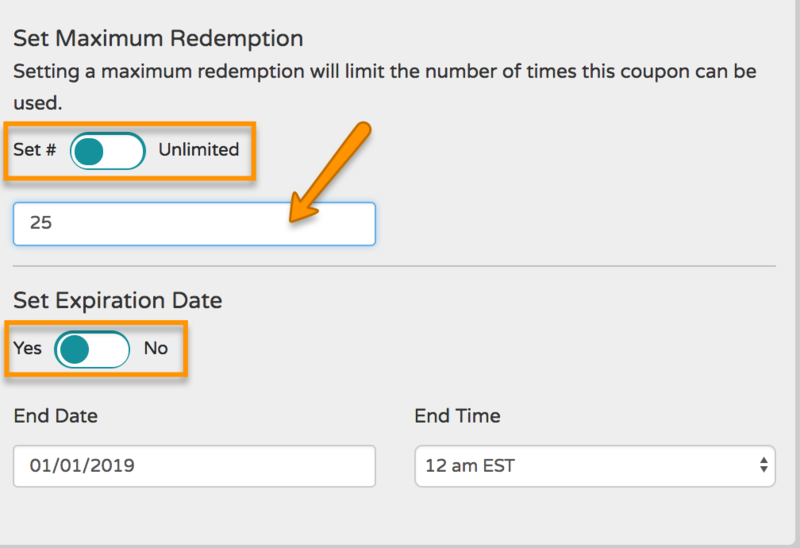 Choose to limit the Maximum Discount Amount in case of a percentage, Set a Maximum Redemption to limit how many times the code can be redeemed, and Set Expiration Date for the coupon. These are all optional. Note: the Set Expiration Date creates a deadline for when supporters can redeem the Coupon Code but will not affect recurring payments in the future. If a supporter has applied a Coupon Code for discounted recurring payments, the discount will remain in effect even after the Coupon Code has expired. 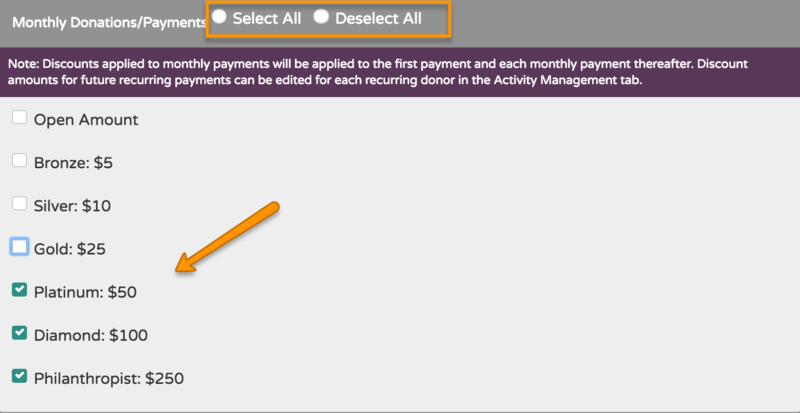 If you want to the edit discount amount for future recurring payments, you can can do so for each recurring donor in the Activity Management tab.